At last no more tired eyes. Now you can scrapbook for as long as you want, whenever you want. 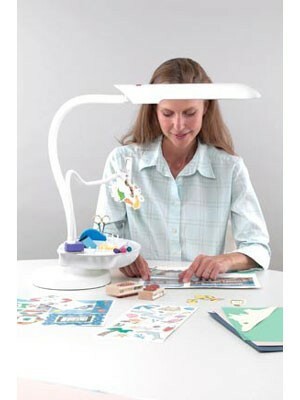 The daylight Scrapbook lamp is great for your eyes and your color matching. Ideal for use at a table. 1. Removable tray for organizing all your Scrapbooking/Sewing tools - glue, scissors, pens etc. 2. Handy clip on a flexible arm which is ideal for holding any scrapbooking materials.